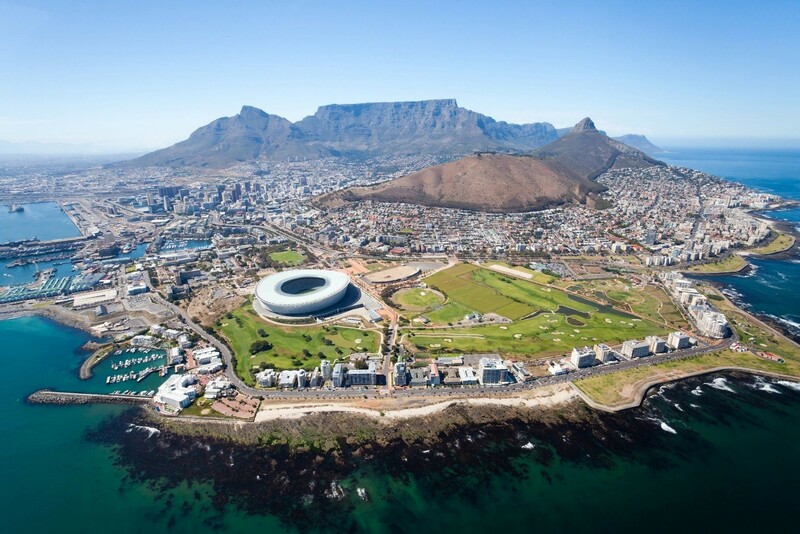 Cape Town is dominated by two geographical features. One is physically imposing, the other is psychologically scarring. The first is Table Mountain, one of the seven wonders of the natural world, which serves to shunt the city towards the topaz sea like a giant roulette rake. The second is Robben Island, 45 minutes offshore, where the story of modern South Africa was written. In between is the cosmopolitan and colourful city itself which, we were told by one cab driver, is so laid back it gave up on apartheid way before it was officially scrapped because hostile discrimination was a just a whole lot of bother. The Atlantic Ocean, which shapes the city, has brought with it a fusion of cultures meaning the city is a delightful and recognisable mishmash of the influences and styles. Cape Town, barren in some places, lush in others, feels like Africa-lite, more like a modern European city, with familiar names on the shopfronts and items on the menus but with that sense of outpost that adds the frisson of adventure. South Africa has grown something of a reputation for crime in recent years but we sensed no danger at all in light and bright CT.
Jo’burg, we were told, was where the bother was. Here, everyone was delightfully friendly and hospitable. The prosperity of the city depends on it. The flat disc of Robben Island is a solemn and barren scratch of land, once a former leper colony and latterly the enforced home of Nelson Mandela, whose image and aspirations dominate the city. His 8ft x 7ft sparse cell has become something of a secular shrine and the entire graceless island has an air of melancholy and loss. The sense of injustice is made all the more real by the tour guides, who are former inmates, picking out their younger selves on scratchy black and white photos and telling tales of deprivation, despair and defiance. The hop-on, hop-off bus also took us to the foot of Table Mountain which was followed by a vertiginous cable car ride. At the base, the temperatures were hot, at the top, there was a chill wind, made even more so by rolling cloud. (When the clouds shroud the mountain like a waterfall, it is known as the “table cloth”). The flat surface, cut through with paths and access to the cliff tops, feels like the land that time forgot such is its sense of isolation. The stubby vegetation and profuse wildlife seem altogether different from that down below. Dassie, lovable guinea pig creatures, scamper around your feet and there are species of snake and lizard who dwell here. The views are breath-taking, requiring panoramic shots, a pair of binoculars and a durable sense of awe. A walk to the top takes up to four hours each way and is tough. The Victoria and Alfred Waterfront offers a scenic backdrop to a wealth of shopping, eating and tourist experiences (such as an aquarium). The story is familiar – a 1992 revamp of docklands that had been in decline since the 1960s. Plenty of sights – the swing bridge and clocktower, the Nelson Mandela Gateway, Nobel Square (with its statues of prize winners) – are squeezed among some original Victorian buildings. Seals sun themselves on platforms left for the purpose. South of the V&A there is a stretch of beach facing the Atlantic, including Camps Bay, which has a more traditional seaside offering; it also marks the beginning of the wild coastal scenery heading towards the Cape of Good Hope. For a fuller understanding of the Apartheid, a tour of District Six is a necessity. We did so by the hop-on, hop-off bus which has a commentary. In keeping with its dystopian feel of the separation, District Six was the name given to a vibrant, multi-cultural municipal area re-zoned as whites-only. Some 60,000 residents were forcibly removed. The moving museum has a painted floor map showing who used to live there before the bulldozers moved in. While apartheid is gone, the road from the airport is lined with shanty towns, held together with electric cable and luck. Interesting as an insight into the legacy of oppression, but not recommended for an unaccompanied tour. Not too far away from District Six is the oldest building in the city, the 1666 Castle of Good Hope, a well-preserved sandstone pentagon which served as a fort of the Dutch East India Company. Sad to say, I have nothing but traumatic memories of this place. True to form, I got hopelessly lost and found myself with increasing levels of panic trying to reunite with my party. The place is vast. The land was bequeathed by Cecil Rhodes in 1902 and created in 1913 to protect the floral wealth. Among the exotic flowers, there is plenty of indigenous wildlife as well as a sculpture garden, all with a backdrop of the Table Mountain. Lush and rich, it is called the “most beautiful garden in South Africa”. Away from the metropolis of Cape Town itself, and about half an hour or so by taxi, is Simon’s Town, which has a colonial feel. It was Britain’s main regional naval base and still serves that purpose for different bosses. The shopfronts look out over the choppy waters of False Bay, protected from the Atlantic, and there is a wealth of Victorian architecture along the Historic Mile. You could be in a rather exotic Brighton. But the main lure is Boulders Beach with its enchanting colony of African penguins which stand, dozens strong, capturing the sunlight, occasionally taking a dip in the sea or retiring back up the beach to the many nests created for them at this nature reserve. There are plenty of excursions into the winelands (Stellenbosch the most famous) but our time was short and we opted instead for a two-night stay in Inverdoorn, a safari park about two and half hours from Cape Town. We went by taxi which, cost us but removed some of the pressures (although they drive on the left). The accommodation was fairly unsophisticated, which added an edge of adventure to our stay and, at night, in the middle of nowhere, the unpolluted night sky, increased the sense of isolation. We drank beers round an open fire but ate well at tables. But the highlights were the two tours of the park, one in the evening, one in the early morning. We were promised the big five – lion, elephant, buffalo, leopard, rhinoceros. This place focussed heavily on conservation so the cheetahs were being rehabilitated and the lions had been bred for hunting and saved, but too late for them to look after themselves. However, as we bounced around in our truck, being informed by a knowledgeable guide, nothing quite allows for the breathless thrill of alighting upon an elephant with her calf, or a giraffe peering down through thickets of brambles. A wonder.